Cookware Chemistry 101: What Substance Makes the Best Pan? If nothing sticks to Teflon, how do they get Teflon to stick to the pan? Aluminum cookware (especially the hard-anodized kind) is not only safe (as even the Alzheimer's Association states that "studies have failed to confirm any role for aluminum in causing Alzheimer's) but also preferred by chefs. Top brands like All Clad, Anolon and Calphalon are available for home chefs, and are a staple of wedding registries. The aluminum core is sometimes covered by stainless steel, sometimes by non-stick coating. The good stuff is pricey, though, and heavy. Williams Sonoma offers an All Clad 27-piece "fantasy" set for the whopping price tag of $2,599.95. But you can get a regular starter set for around $250 from stores like CHEFS with free shipping. Note that non-stick options from these brands are anodized aluminum covered by a Teflon-like substance. The debate over Teflon has been raging for decades, and news continues to point in both directions. Just last month, researchers at West Virginia University found a link between perfluorocarbons (PFCs) and early menopause in women, and one of the leads of the study suggests avoiding Teflon cooking pans. But plenty of people use Teflon and its non-stick cousins and descendants regularly, have for years, and swear by it for easy clean-up. If you go high-end, like a non-stick pan from the All Clad, Anolon and Calphalon families, you'll pay what you would for anodized aluminum. But there are some deals out there, like this 12" lidded Calphalon Everyday pan from Macy's for $24.99. What's to fear from ceramic? The effects of lead poisoning are well known, and cadmium is a toxic substance that is banned in most of Europe. While chances are your cookware is just fine, that might not be the case if you bought it from a country where the lead and cadmium limits are not as strict as in the U.S. or Canada. So check to see where it was manufactured, and consider replacing old cookware that might have predated stricter manufacturing standards. Ceramic coating (or nano-ceramic as some tout it), is usually a coating on top of aluminum pans, and brands in this line include Ozeri, Bialetti, Cuisinart Green Gourmet, ScanPan and EarthPan. Prices vary, but Target and other retailers sell a line of EarthPan ceramic cookware, for around $170 for a starter set. You can buy a 10" non-stick Bialetti sauté pan from amazon.com for $30 with free shipping. Bamboo steamers and crockery have no real environmental hazards to speak of. Bamboo is, of course, renewable and surprisingly, steamers are even dishwasher safe. You can find a Joyce Chen 10-inch steamer set for under $20. But, of course, this is only for steaming, and won't get you a very good fried egg. Cast iron has been around for a long time, and has come back into vogue thanks to TV chefs like Paula Deen. The metal offers a nice mix of even cooking, heat retention and no-stick properties. It even releases unnoticeable bits of iron into food, which can be a good thing; our bodies need iron as an essential mineral. But our bodies also can have too much iron, causing iron toxicity. That's especially a risk with unglazed cast iron, which may release higher quantities. So those already experiencing iron toxicity problems, or children younger than 3 who are susceptible, shouldn't eat meals cooked in cast-iron cookware. The top-of-the-line for enamled cast iron has long been Le Creuset, which at the high end costs $200 a piece or more. But you can find deals on various Le Creuset items, and can sometimes find odds and ends at discount stores. There are budget options also, like this Paula Deen's signature line and Lodge Logic. If you're looking to go retro, scour some yard sales for vintage cast iron cookware, reseason it and cook yourself some eggs over an open fire. Before we get into the how, let's first sing the praises of copper cookware: It has excellent thermal properties, and under normal conditions is extremely safe, especially when lined with stainless steel. But regular copper cookware is coated with nickel, and thus can cause a problem for those with nickel allergies. 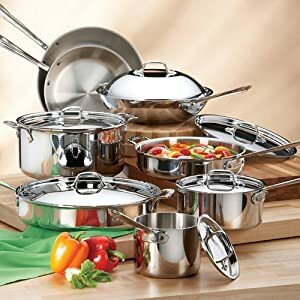 Sears offers a 10-piece set of copper bottom pans for $76, with coupon code "SEARS5OFF50" and an extra 5% off coupon. For high-end, just look to a site like Creativecookware.com for a variety of options. As with copper pots, there is some nickel used in the production of stainless steel, which can cause allergic reactions in some people. But overall, stainless steel is durable and corrosion resistant. It can even be quite eco-friendly, too. Our friends at eartheasy.com single out Fagor America as "a very progressive cookware company that offers very high quality healthy cookware." You can check out some Fagor products at Target. On the high end, remember, you can also get All Clad, Calphalon and Anolon with stainless steel coating over anodized alumninum. Lou Carlozo is dealnews' new Green Dad columnist. He was most recently the managing editor of WalletPop.com and, before that, a veteran columnist at the Chicago Tribune. Follow him on Twitter— @LouCarlozo63. You can also sign up for an email alert for all dealnews features.